10 VHS BUNDLE - HORROR - ACTION - DRAMA - SCI-FI - FREE POSTAGE . Condition is Very Good. Dispatched with eBay delivery – Shutl 2-3 days. 29 × Sci Fi and Cult VHS Video Joblot. All Different Title. 29 × sci fi VHS Video Joblot. All Different Title.. Condition is fair. Dispatched with Royal Mail 2nd Class. John Carpenter's. Cult Horror Exploitation DVD & VHS. VHS Horror Video. Condition: Good / tape clean / unable to check. 2019 after the fall of new york VTC vhs ex-rental pre-cert video. Condition is Good. Tape is mould free and playback is good for the age of the tape. Sleeve has some signs of ageing. Dispatched with Royal Mail 2nd Class. Postage discount on up to 4 tapes. A VHS VIDEO CASSETTE. 20th CENTURY-FOX PROMOTIONAL VIDEO. NICE COLLECTABLE FOR THE LOVERS OF THIS OUTSTANDING FANTASY FILM. A SCARCE VIDEO AS IT WAS NOT SOLD TO THE PUBLIC, USED AS AN ADVANCE PROMOTION FOR THE RELEASE IN 19. New listingJurassic park Vintage vhs case dna set 1994 extremely rare collectors Piece. Jurassic park Vintage vhs case dna set 1994 extremely rare collectors Piece. Includes the vhs tape, map, DNA book, watch and security pass. 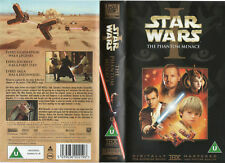 Also includes a booklet in the vhs case. RAMBO, CRACKERJACK, PREY FOR DEATH, RING OF FIRE, GAME OF DEATH 2, ACT OF PIRACY Selling as no space for them. Tapes £3.50 PP Offer of any 2 for £6.00 PP Postage is £2.95 No broken cases or films, all clean and working order. Short Circuit 1 & 2 RARE VHS Bundle CLASSIC 80's SCI-FI Great Collectors Items! Short Circuit 1 & 2 RARE VHS Bundle CLASSIC 80's SCI-FI Great Collectors Items!. Condition is Very Good. Dispatched with Royal Mail 2nd Class. Deep Space Nine DS9 VHS Video Tapes x 3, from season 7. Condition is Good. Dispatched with Royal Mail 2nd Class. Star Trek VI The Undiscovered Country VHS Cassette Tape.
" Alien " is the first movie of one of the most popular sagas in science fiction history, and introduces Sigourney Weaver as Ripley, the iron - willed woman destined to battle the galaxies ultimate creature. Robocop 2, VHS, Orion, Small Box, Rare! Robocop 2, VHS, Orion, Small Box, Rare! . Condition is Very Good. Please check out my other Vhs films for sale. If there is a film you may want. but not see please ask as I may have it. But not listed it yet! Dispatched with Royal Mail 2nd Class. You are bidding on a rare early 1980’s CIC Video ‘big box’ VHS video - “The Cartoon Adventures Of Gene Roddenberry’s Stark Trek”. This is Volume 5 and contains 4 episodes originally broadcast in 1973! Tape, case and cover all in very good condition (see photos as part of item description). Happy bidding!! VHS VIDEO EX RENTAL/ HOLLOW MAN/ COLUMBIA-TRISTAR VIDEO LABEL . The cover is in good condition with no wear to the edges and is free from stickers and labels. The top label is also in good condition and free from stickers and labels. The cassette is in good condition but has 18 cert video shop stickers on it. Cassette comes in a big clamshell video box. Playback on the video is good. ( FIRST 5-10 MINUTES OF VIDEO TESTED ONLY). Classic 80s Horror Movie. Cult Horror Exploitation DVD & VHS. VHS Horror Video. Part 5: The New Beginning. Star Trek DS9 Deep Space Nine Complete set of 88 VHS tapes ( 2 duplicate tapes). 2 episodes per tape. The X Files: 82517. UK VHS release of The X Files episodesNisei and731. This is a cool item. Small box. Tested and works. Lots of photos are included so you can see exactly what you are buying. I will help as much as I can. There's no problem there. Its condition is consistent with its use and age. All have been owned since new and are in excellent condition. Over 35 Star Trek Video Tapes in excellent conditions. This collection includes some of the best episodes from all of the series, 3 special collectors editions (TNG: All Good Things, Star Trek Generations and DS9: Emissary) and seven Star Trek movies. VHS STAR TREK MOVIE COLLECTION FILMS: 1 TO 8 #EC#. Collectors boxed set. Perfect for Star Trek lovers, like me! Sadly I’m selling all my collections of Star Trek stuff as I’m moving abroad. In good condition, the box has a few marks etc as pictured but certainly no tears or rub through a. A limited edition (only 30,000 units) box set from the cult favourite TV show. 'The Secrets of the X Files' is a behind-the-scenes look at the making of the show, including a look at the truth behind the storylines and interviews with cast and crew. Classic 80s Horror Movie. Cult Horror Exploitation DVD & VHS. VHS Horror Video. Condition: Good / tape clean / unable to check. ‘Tremors 4’ Big Box Ex Rental VHS. Good used condition. Sent well packed. 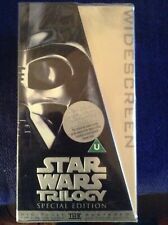 Please have a look at the other VHS I have listed. Combined postage in UK is £3.95 for 2-4 tapes. Please contact me when you would like combined postage and I will send you invoice for total. Thank-you for looking. This is a vhs video of piglets big movie. File 2: Tooms; A Feature-Length edition of Tooms and Squeeze from Season 1. Box Set VHS PAL Video Tapes. Files 1 to 5. File 5: 82517; HMV Exclusive First Edition Limited Number 1 of 5000. File 1: The Unopened File; A Special Edition X-File Featuring The Cliff-Hanging Episode of season 2 and the concluding episodes of season 3. 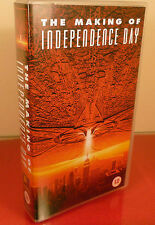 An original UK VHS video of TV series The X Files, episodes Gethsemane, Redux and Redux II. Includes promo flyer for the VHS release of Millennium. The X Files: File 9 Redux. 20th Century Fox 2761S. Star trek the original tv series episodes 10/11: what are little girls made of and dagger of the mind. Star trek the undiscovered country. New listingClassic Doctor Who - Pyramids Of Mars (1975) VHS video. Complete and unedited. Complete and unedited. Condition is very good. Classic Star Trek Video. Condition is Brand New, video is still in plastic wrapping. Dispatched with Royal Mail 2nd Class. If you have any questions please ask and happy bidding!!! Platform: VHS Video. Contents: Case & VHS Only. They watch, with growing dread, at the news of crop circles being found all over the world. Get ready for a close encounter of the scared kind. Title : Signs. Jurassic Park The Lost World Jurassic Park III 3 VHS PAL Video Tapes ALL 3 Films Bundle PAL VHS VIDEO TAPE CASSETTE Used Very Good Condition Please see Photos Postage Free Royal Mail 2nd Class Or £3.45 Royal Mail 1st Class Dispatch Time Dispatched same day if purchased and paid by 3pm Weekdays. 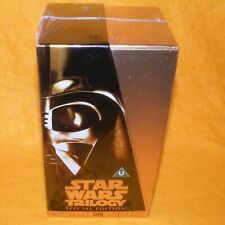 Star Wars Trilogy Special Edition Gold Box Set (VHS/UK, 1997, 3-Tape Set) Sealed. Condition is good. Dispatched with Royal Mail 2nd Class. Please see item description in the listing body. Star Trek Voyager 2:10 The Thaw and Tuvix VHS Pal Video Tape. tape plays great.